If you know someone who has thought about ending their life by suicide, you reali ze how hard it is to know what to say or do about it. Are they just joking? Do they just want attention? Or is something serious going on? 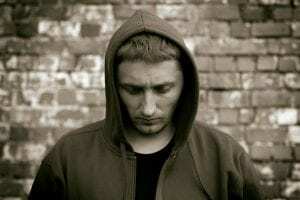 The truth is, most suicidal individuals give definite warnings of their suicidal intentions, but people around them are either unaware of the significance of those warnings or don’t know how to respond to them. If I don’t have anyone to talk to once in a while, to get my feelings out, I get really sad, because I feel like no one cares about me. I think about what would people think if I was dead, or would they be happier without me? I’d hate to think Kendra, or someone like her, would kill herself because she feels no one ever showed her they cared. Perhaps you have a friend like Kendra who has said some things to you that sounded like she or he might be deeply depressed, or even suicidal. It’s very important to recognize those signs. Most suicidal individuals give definite warnings of their suicidal intentions. Make sure you take any threat of suicide seriously. So what can you do to help someone who has suicidal thoughts? Get involved. Be available. Show interest and support. Don’t be afraid to talk with them about suicide. Talking about it does not make it worse, but better. Be direct. Talk openly and freely about suicide. Assure them that you understand that what they are feeling is very real to them, but that they are NOT alone. Let them know you aren’t going to abandon them. If they haven’t brought it up, but you are concerned they are thinking about suicide, ask them directly. Here’s an example how, “Sometimes when people feel they way you are describing they have thoughts of suicide. Is this true with you?” If they are, this gives them permission to talk about it and actually brings relief because someone else brought it up. If they aren’t, they will rush to assure you they aren’t. Ask if they have a plan. If so, take them seriously and move quickly to get help. Remove anything that would help them carry out their plan guns, drugs, alcohol, knives, etc. Offer hope that alternatives are available. 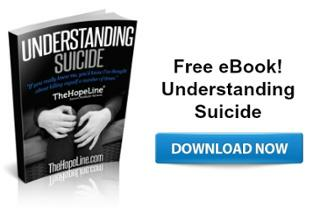 Provide them with a list of suicide prevention resources. Help them fill out the Suicide Safety Plan. Things to Avoid Saying/Doing to Someone Talking About Suicide. It is not helpful to just rattle off a list of reasons to live without first listening to what they are feeling. Don’t dismiss what they are feeling. It is very real to them. Don’t be sworn to secrecy. Get support. Nicole said her sister saved her when she felt suicidal: Because of her, I am still here. If you know anyone who you may think have depression or suicidal thoughts ask him or her if everything is okay and comfort them. It is not so much about WHAT you say. The most important thing you can do is reassure your friend that you love them. That’s what happened when Heather was feeling suicidal: I told [my friend] what was going on and he just kept telling me that he cared, that it wasn’t the right thing for me, that I had so much more to do with my life. But the thing that helped me was that he said he loved me. I had felt so alone and no one had told me that in awhile not even my mom. Remind your friend that no matter how awful their problems seem, they can be worked out, and you are willing to help. Most times a suicidal person needs someone close to them to be a voice of hope. Amberly agrees: Sometimes all you need is to be loved and know someone is there to catch you when you are about to fall. You could very well be that voice of hope to someone you love. Your efforts might just save someone’s life. Thank you for reaching out to talk about your friend. It is important that you talk to a trusted adult about the situation. Someone you are comfortable with. Your friend has put your emotional health and mental health at risk by asking you to do this. It is better to risk having a friend hate you than to lose a friend to suicide. To talk about how to help your friend, right now, call the National Suicide Prevention Lifeline at 1.800.273.8255 or chat online with them at https://suicidepreventionlifeline.org/chat/.You can reach the Crisis Text Line 24/7 by texting “START” to 741-741 Here is a list of additional suicide prevention resources https://www.thehopeline.com/suicide-prevention-resources. They have resources specifically for this situation you are in with your friend. Please take the next step to contact them. I tried doing all these things all the articles say to do when a friend is suicidal. And that friend who I loved so much, just dumped me and cut me out. I have been heartbroken for almost a year. It will be helpful to add that if you sense a person is suicidal that you not only remove objects such as guns, knives, medications, etc but also their car keys. Many time a person who feels deeply suicidal will threaten and act upon using their vehicle as a mechanism to end their life via using it to hurt/kill themselves but even worse… others. My best friend has told me she has self harmed, and that she has thought about suicide before and I’m so worried for her. She has anxiety and might be depressed, or I think she told me she has depressive traits. She has told her mum, so her mum is trying to help her, but I still want to help. Today in school she was jokingly saying that she wanted to die, and I knew she wasn’t joking so I said that I don’t want her to die, but I don’t know what else to say and I don’t want to say the wrong thing. And I’m so scared that she will, it terrifies me. I have an online friend who continually tells me they are taking their life “soon”, “in 10 days or so”, “My end is near”, etc etc. I’ve been hearing this for years. What do you say when you’ve already said it all? I have a friend who cut me out of his life after I asked him if he had thought about suicide. He has been incredibly depressed and had been coming to me several times a week so he wouldn’t have to be alone. His girlfriend had said he was “hopeless” and withdrawing so I asked him if he had been having thoughts about harming himself or suicide. He didn’t say anything just left and won’t take my calls/texts/messages. I’m not sure what to do, but I would love information that I could send to him. Is there a place that would call him and reach out? Maybe if it’s a third party he won’t feel like he’s letting everyone down. He hates the idea of being embarrassed or being weak in front of most people he knows. I’m open to anything guys – thanks in advance for the help. Michelle, It’s good he has a friend, like you, that is really listening and cares. We have HopeCoaches available every night at 7 pm Central that would chat online with him if you want to give him that information. Just give him http://www.thehopeline.com/gethelp. You are welcome to chat with a HopeCoach too. The burden that you feel for him is probably overwhelming to you. Also, the National Suicide Prevention Lifeline has some resources on how to help a friend. You can also call them at 1.800.273.8255 or chat online with them at https://suicidepreventionlifeline.org/chat/ to ask them what you should do to help him. You can reach the Crisis Text Line 24/7 by texting “START” to 741-741 too. This is all good information to give your friend too. I have a friend going through a similar situation. I just found out last night but the signs where always there, I was just so blind. her family situation is getting worse and worse and so is her relationships with friends. And honestly, the best advice there is is to always be there for her, always support her always want to hangout with her only to be there for her and NEVER stop saying how much you love her.